Have you been searching and praying for a lighter, safer and cleaner way to clear and clean drains? So were we, we could not find a better way so we developed our own lightweight drain cleaning solutions. We have noticed that as we get older drain machines seem to be getting heavier. The truth is, our aging bodies cannot take the heavy abuse it once could. So, we had two choices; find a different job or make cleaning drains easier and lighter. By now a lighter, safer and easier way to clean drains should be an option. Cleaning a sewer is one of the most dangerous and disgusting dirty jobs one can do. 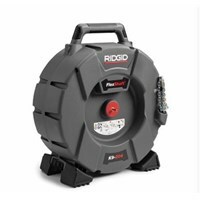 It is commonly done with a heavy roto-rooter tool, which uses open, spinning, kinking cables that get covered in waste that can easily make a huge mess. By putting flex shaft into an outer casing we made our job cleaner, safer, and way more effective. We are attracting a new class of drain cleaners because brute strength to move our equipment around is not a necessity. How do Clog Dogs and Flexshaft Work? 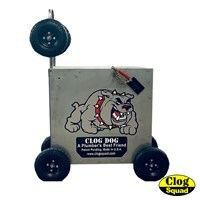 Clog Dogs and Flex Shaft work Great!!! We have found that Clog Dogs and flex shaft are a game changer because they are light and easy to use. They work by spinning fast and using ultra-high-speed verses torque to get the job done. By using flex shaft at ultra-high-speeds the chain heads become a buzz saw, chewing up roots and spitting them out like sawdust. Can you clean a 6" line through a 1 1/2" clean out? In our search to find a lighter and cleaner way, we discovered that with flex shaft we could go into a small opening and clean out a larger line. That is correct; we can go into a 1 1/2" cleanout and clean the roots and grease in a 6 or 8-inch line. Flexshaft has made it possible to do some amazing things, like go through a 2" trap to clear a clog. We can even go through some toilets to get the branch line flowing. Can you leave your sewer machine outside and clean a drain through a window? When we can we leave the Clog Dog outside and easily bring the flex shaft down the stairs, or through small gaps like a basement window and into the clean out to get the job done. There is no heavy lifting because the biggest Clog Dog we have only weighed 135lbs and has six wheels to assist in most maneuvers. Clog Squad has been using Flexshaft for over four years now, and it has dramatically changed the way we do business. Our goal now is to share what we have created with our brothers in drain cleaning. We're building a team of forward-thinking plumbers and drain cleaners who would like to help us revolutionize the drain cleaning industry into a lighter, safer and cleaner one. Contact us today!